What do you do when you are planning green chicken curry but the butcher doesn't have any chicken? Mass produced flabby pale flavourless chicken does not count. You are wanting something spicy, clean tasting and fragrant. Well, you improvise, don't you? So you ask for a rack of lamb because it looks really good. Thinking that you could do something, maybe regular roast rack of lamb with a Thai style salad on the side, perhaps with noodles. Or maybe you could flavour the lamb some how. How about a rub made with chilli, lime leaves and lemongrass. Well, if you are going to do that why not just make it easy and use some green curry paste and rub that on the rack? So that is what I did. 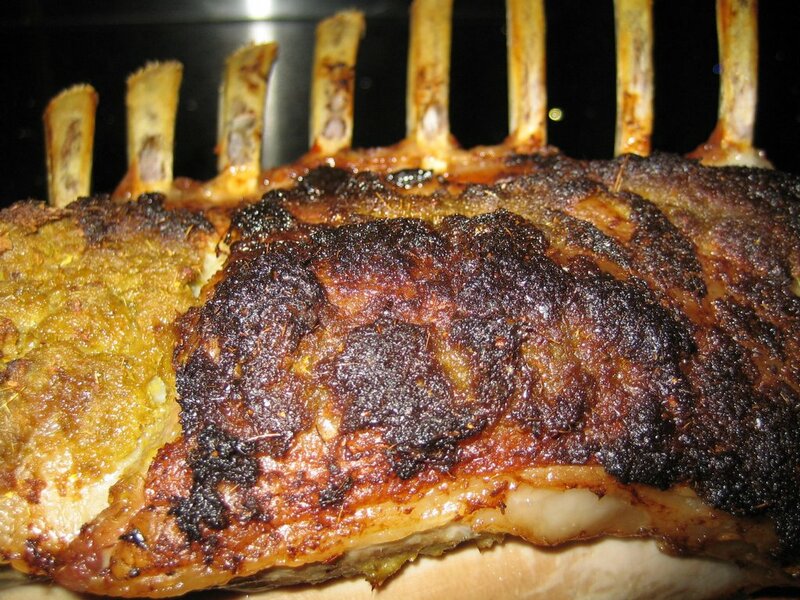 A typical preparation of a rack of lamb is with a herb crust. The crust protects the delicate meat on top of the ribs during the roasting process, resulting in a more succulent mouthful than a naked rack, roasted. Usually the herbs and flavours involved are more European in nature - parsley, mint, rosemary, lemon and garlic. It is just that in this instance the herbs and flavours are further to the East - lemongrass, kaffir lime and fish sauce. The crust was spicy, but the fat on the lamb protected the meat and ensured the flavour that penetrated the meat was just the right level of flavour and piquancy. The mild and sweet flavour of the lamb was not overwhelmed by the curry, but rather complimented. Rub a rack of lamb with enough green curry paste to give a good coating on all sides. Roast at 190ºC for 25 to 30 minutes or until it looks cooked to your liking. Rest for five minutes on a wooden board shrouded in foil. Slice into chops and enjoy! Hey Emma, As we say in the trade, a top cut indeed. That happens to be in the hairdressing industry but the alignments are obvious. We both like to eat.